Ad Astra Comix is excited to announce an upcoming anthology by Peter Collins, a Canadian artist, AIDS activist and prisoner. Peter has been imprisoned for more than three decades at various prisons. In that time he has worked as a prison abolitionist, challenging the racism, incompetence and corruption of the prison industrial complex. 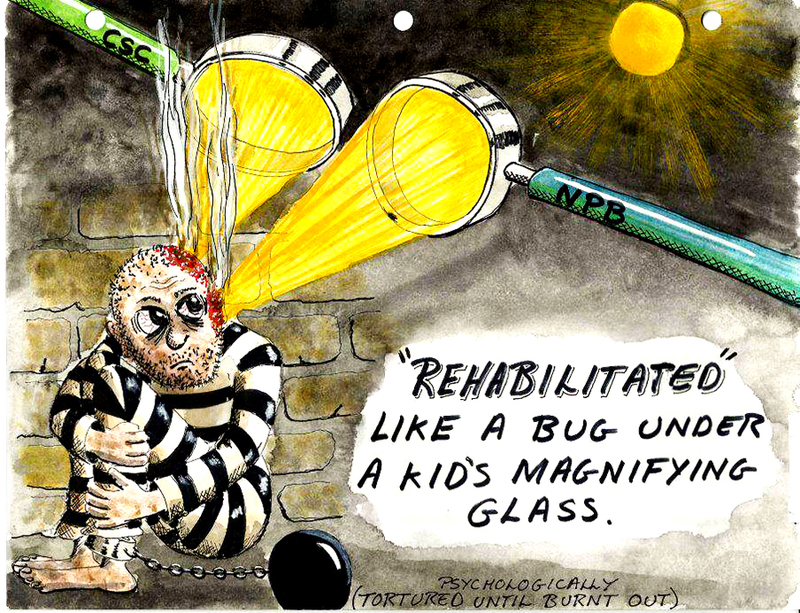 He has also honed his skills as an artist and produced hundreds if not thousands of comics about Canadian politics, life in prison and social justice. Recently, a friend reached out to us to see if we would be interested in publishing Peter’s work. After getting a chance to look at his biting commentary that alternates between very dark humor and very human vulnerability, we were happy to say yes. We are glad to be working with Peter as well as some of his friends and supporters to help crowd-fund and publish an anthology of his work to form part of a record of the life of this man. On a somber note, Peter is currently suffering from an aggressive cancer that has spread from his bladder to his stomach walls, lungs and bones. He is entering the 32rd year of a Life 25 sentence. He has spent the better part of the last 3 decades trying to make amends for the suffering that he caused when he killed Constable David Utman. He has worked to personally transform himself, and to make the world a better place. His risk has been addressed long ago, and CSC refuses to release him because of his political advocacy and critique of the prison system. We hope that undertaking this project will help raise awareness of Peter’s situation and help push for him to be granted compassionate release. This anthology will be our small part in amplifying the voice of a thoughtful, compassionate man who has overcome incredible obstacles to live a giving, creative life. To keep up to date on the details of Peter’s situation, you can like the Peter Collins Support Committee on Facebook. To stay up to date on this project, follow Ad Astra Comix on Facebook and Twitter if you haven’t already done so. We will be posting examples of Peter’s work in the lead-up to the crowdfunder. Thanks for taking the time to read – Stay tuned for more details! 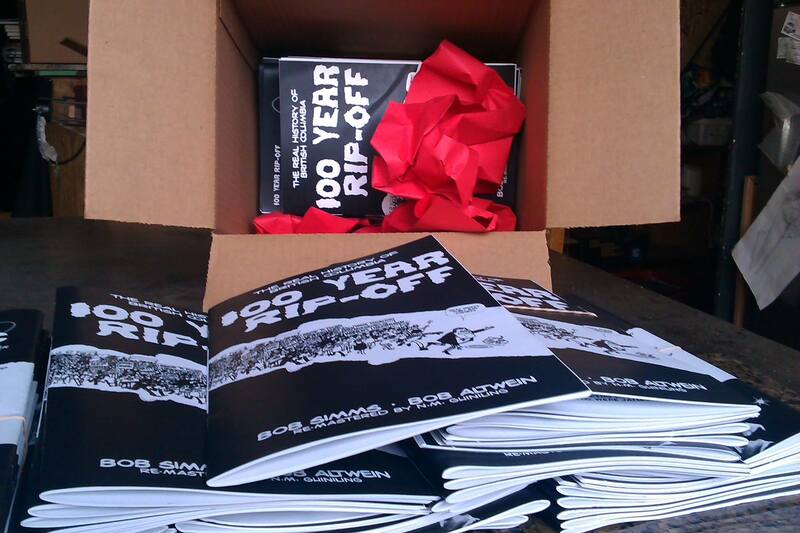 100 Year Rip-Off is Back from Printers! Fresh out of the box – mmm, the smell of slightly burned toner. Fresh Out of the Box! On Tuesday this week, I got the call to come and pick up 5 boxes of freshly printed comics – 100 Year Rip-Off has come back to life. For those of you who follow these posts, you’ll know that this has been Ad Astra’s main project for the past few months. First order of business is filling pre-orders from the lovely folks who supported me during my Indiegogo campaign–they are deserving of a comic on their doorsteps immediately, along with my most heartfelt thanks. It feels wonderful to have people around you who believe in your project. This Summer has been such a blur of activity, I feel like I haven’t really had time to sit down and process my first publishing experience. From the get-go, I liked the idea of publishing creative work from someone other than myself for the first go at it–I feel like creating and producing are two very different processes that deserve their own special care and attention. Likewise, I wanted to give myself at least some mental time and space to look at the process as much from outside myself as possible–a hard thing to do when you’re staring your own brain child. And so I impart to you the lessons I’ve learned from this experience from Day 1 – from initial planning, getting in touch with creators, editing, printing, fundraising, and retailing. Make a Timeline. It’s not that we all follow calendars, but they help your brain foreshadow the journey in which you’re about to take part. Get a cheap calendar from the dollar store, or a get a big piece of paper, and lay out everything you think will be involved in the process of your project. Enjoy the Process. A lot of the editing work with 100 Year Rip-Off was incredibly tedious–essentially going over each image with a magnifying glass. But I actually enjoy this work, and find the focus involved therapeutic. If you find yourself going into territory that is boring or frustrating–but necessary for your project’s completion, find a way to make it a more enjoyable experience. Creativity, love, and care in work all stem from savored moments. Don’t rush it. Seriously Calculate Finances. Seriously. I know everyone hates it, but understanding how much your project is going to cost is pretty important–especially when you’re asking people to help you out with money. This brings me to my next point, which is Indiegogo related. Details of Delivery. Once your project is done, how’s it getting out to people? If you did a crowd-funding campaign, did you calculate for postage? How about international orders? These all seem like “good problems” to have, that you’re willing to table until you’re far enough along that they will come up–but think about them now. I included a promotional poster in with my Indiegogo campaign–one that I wanted to send unfolded to contributors. Well, after the campaign had ended, I found out that shipping it unfolded was going to cost 2-3 times as much as what people had donated for it! FAIL. Keep shipping in mind. … I may add to this list later, but these are my immediate reflections on this particular project. I’d like to take some more time in the near future to really lay out the anatomy of the process, and perhaps turn it into its own How-To project. After confirming the project with the work’s artist, Bob Altwein, I am now set to begin reprinting 100 Year Rip-Off within the next two weeks! An exciting add-on to this momentous occasion (my first experience with “printing”/”publishing”) is some supplementary information that I’m providing within this graphic history of British Columbia. Posted here is an “Historic” Map of B.C. that I’ve drawn. It includes the territories of First Nations in the province; relief camps during the 1930’s, which were hotbeds of squalor and social unrest; and finally, the locations of B.C.’s 15 WWII-era internment camps, where thousands of Canadian citizens and residents of Japanese descent were held against their will. It was the largest mass exodus in Canada’s history. Needless to say, I was a bit surprised that even this basic information (the numbers and locations of these camps around B.C.) necessitated several hours at the Toronto Reference Library. 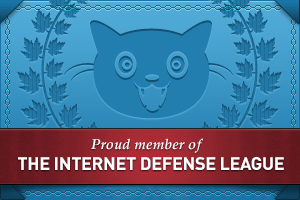 You think everything is on the internet… until you want to investigate history in detail. 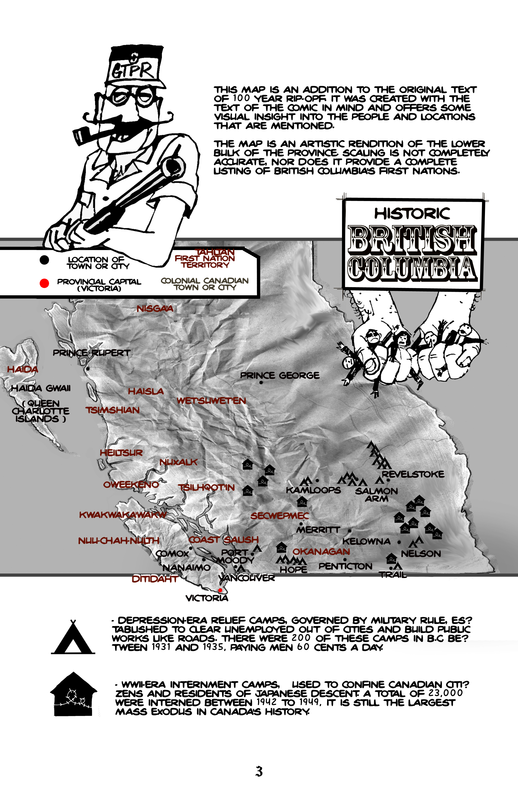 While the map is located on page 3 of this 30-page comic book, I have also added a glossary of names and terms to the back, for those outside of B.C. who may not immediately understand that B.C. Hydro is our public electricity company, or that the I.W.W. stands for Industrial Workers of the World. I look forward to your feedback! If this is up your alley, then stay tuned – #100Year Rip-Off will be available for purchase as a 30-page comic book in July 2013!